I happened to be picking plums from our orchard this afternoon when I was hailed from afar by a man of some years, accompanied by two ladies who were also on in years. “Do not be alarmed,” he said. He had worked on our property as a boy and wanted to see what had become of it. So I invited the party to refresh themselves on our terrace. The man had worked on our property for about four years between the ages of 12 and 16 during the wars years, 1940-1944. There was no electricity in our region then. There had been about forty farm animals on the farm that has become our house at the time. In front of the old farmhouse there was a marsh that was used to feed the cows, and an old well, which never ran dry, has also disappeared. There was a baker and a blacksmith in our village then, where there is no commerce now. He lived in the farmhouse which later sank into ruins and from whose old materials our house was built. The bedrooms in the two-story building were reached by ladder, apparently, there was no staircase. He lived in a bedroom on the ground floor. The owners of the farm were a family of Italian origin. They were poor, according to our visitor. Nearby there was a farm that belonged to Italians from the region of Trieste, and these people were apparently quite big and strong. For the beating of wheat, the young man had to rise at four in the morning, walk a certain distance, and then harness three pairs of oxen to the metal implement that beat the wheat, and there was often trudging through mud. He did not have boots for doing this work. I think he was saying that they had a kind of wooden clog. The trio now live in Montauban, a small city about sixty miles away from us. They were very pleased with our American hospitality. I was told that I have virtually no accent in French, which is not true, but sometimes I am told this, and it is always a pleasure to hear this. 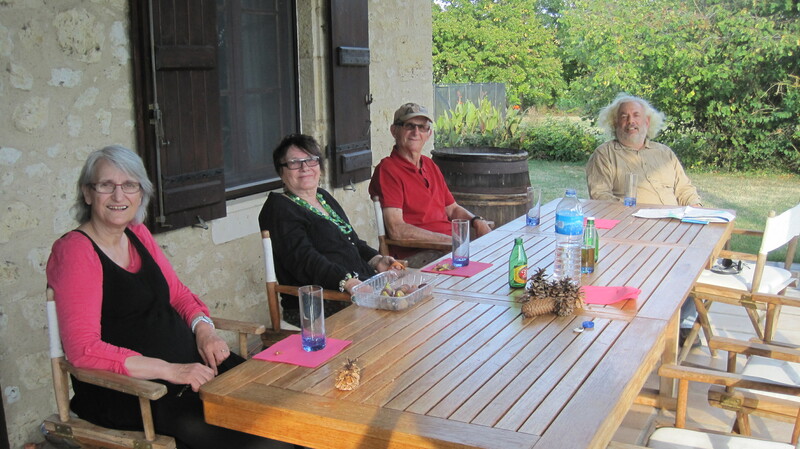 It was a great pleasure for Georgiana and me to meet this trio of people, one of whom had such old ties to our property.